A KAIST research team has developed a graphene-based hybrid storage device with power density 100 times faster than conventional batteries, allowing it to be charged within a few seconds. The team states that it could be suitable for small portable electronic devices. 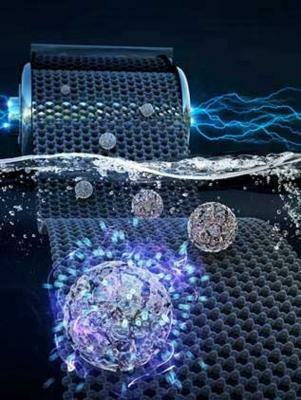 The researchers developed an aqueous hybrid capacitor (AHC) that boasts high energy density, high power, and excellent cycle stability by synthesizing two types of porous metal oxide nanoclusters on graphene to create positive and negative electrodes for AHCs. Researchers at the Institute for Basic Science (IBS, South Korea), in collaboration with teams from the University of Birmingham and the Korea Advanced Institute of Science and Technology (KAIST), have developed unique graphene-based lenses with tunable features. These optical devices, made of graphene and a punctured gold surface, could become optical components for advanced applications like amplitude tunable lenses, lasers (i.e. vortex phase plates), and dynamic holography. 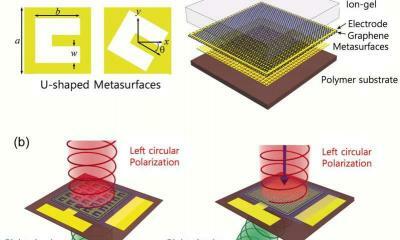 The scientists explain that metasurfaces are new 2D materials that can effectively control the electric and magnetic components of light (and other electromagnetic waves) and bend them to chosen directions. Controlling the beam's direction can bring out interesting phenomena; the most incredible being the "invisibility cloak effect", where light waves bypass an object recreating the image beyond the object. Researchers at the Institute for Basic Science (IBS) and KAIST have designed a graphene synthesis mechanism using laser-induced solid-state phase separation of single-crystal silicon carbide (SiC). According to the scientists, the laser material interaction technology can be a powerful tool for the next generation of 2D materials. Using molecular dynamic simulations and high resolution microscope images, the researchers discovered that a single-pulse irradiation of xenon chloride excimer laser of 30 nanoseconds melts SiC, causing the separation of a liquid SiC layer, a disordered carbon layer with graphitic domains (approximately 2.5 nm thick) on the top surface and a polycrystalline silicon layer (roughly 5 nm) below the carbon layer. The sublimation of the separated silicon is caused when additional pulses are given, while the disordered carbon layer is changed into a multilayer graphene. Researchers at Korea Advanced Institute of Science and Technology (KAIST) have developed a new graphene oxide-based speaker design said to be specifically targeted for the mobile audio market. The speaker does not require an acoustic box to produce sound. The researchers used graphene in a relatively simple, two-step process that yielded a thermoacoustic speaker. Thermoacoustics is based on the idea that sound can be produced by the rapid heating and cooling of a material instead of through vibrations. Researchers from Korea Advanced Institute of Science and Technology (KAIST) have fabricated light-emitting diodes (LEDs) based on graphene quantum dots (GQDs). The researchers made pure GQDs using a cost-effective, scalable and environmentally friendly method that allows direct fabrication of GQDs using water, without surfactants or chemical solvents. Those GQDs were then used as emitter material to create an OLED device.The scientists constructed GQD LEDs exhibiting luminance of 1000 cd/m2, which is well over the typical brightness levels of the portable displays used in smartphones.